Today, Ubisoft announced a new short animated movie called Assassins Creed: Embers which will ship when Assassin's Creed: Revelations hits stores November 15th. Assassin’s Creed Embers will expand on the final chapter of the life of master assassin Ezio Auditore and a journey that has spanned more than four decades. 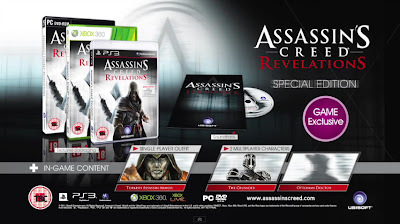 Developed by Ubi Workshop, Assassin's Creed: Embers will be available with the Assassin’s Creed Revelations Animus Edition, Collectors Edition and for download on XBLA and PSN! Dracula. Seek out the hanging cell of the infamous leader to retrieve his personal blade, a deadly close quarters dagger capable of dispatching any foe. - In-depth encyclopaedia, with comprehensive entries on the major characters, events and other important aspects of the Assassin’s Creed® universe. - Explore the prison of legendary Vlad the Impaler, the scourge of Constantinople who inspired the myth of Dracula. Seek out the hanging cell of the infamous leader to retrieve his personal blade, a deadly close quarters dagger capable of dispatching any foe.